Friends we often say that the police never reaches at the time but that is not only the problem with Indian Police department Hear you can see in the pic that how technical, skilled and well established is our police department. 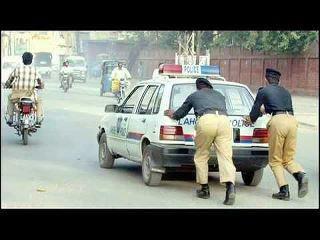 What can we expect from such a police which even is not having a proper car to travel from one place to another as you can see that the 2 police men are pushing the car to make it run. They are used in improper way. I find it a pity that our police force is undermanned and under-budget to fight crime. I don't see anything changing anytime soon.